To be honest, “Follow Up” is a broad term. There are lots of different ways you can Follow Up, and there are lots of media & communication channels you can use. The most important thing about your Follow Up is that you use a lot of variations — both in your messaging and in your media. The key is to stay in front of your prospects & customers so you are “top of mind” and so you can continue to build a relationship with them. We live in the age of Content Marketing. Today’s customers want more than just aggressive sales messages in their face constantly. The reason Follow Up is so effective is it allows you to keep that communication channel open between your business and your customer. 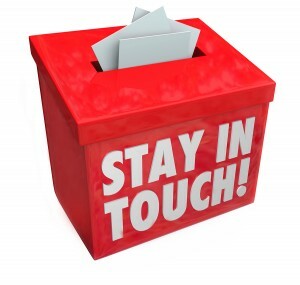 Believe it or not, just staying “in touch” with your prospects will build trust now that can lead to a sale later. The long-term goal of Follow Up is to turn your prospects into buyers and then into Lifetime Customers. The short-term goal is to build trust, create positive associations, and forge a relationship. 1. Send out birthday emails (or mail birthday cards). 2. Do a weekly (or monthly) email newsletter. 3. Make it easy for readers to subscribe to your blog. 4. Create lots of posts & activity on your social media channels. 5. Do periodic live webinars. 6. Send out helpful content-focused emails. 7. Give away free reports, free ebooks, and other goodies. 8. Send out holiday emails. 9. Start using SMS Text Message marketing. The sky really is the limit with Follow Up. Remember: your most important objective is to stay in front of your customer as often as possible and with as many different media channels as possible.